3D production trainer Ray Hannisian conducting one of the snapshot 3D workshops in Singapore. 11 November 2010 NEWS & VIEWS SINGAPORE -- With the regional industry abuzz with curiosity about 3D, content producers are challenged to learn how to create the right workflow to produce compelling 3D content. However, the transition to 3D is far from easy. Everyone in the production chain --- from producers, directors and set designers to lighting directors, camera operators and technical personnel --- has to acquire new skills and also a wide range of technical subsets to even begin working in the 3D medium. These are just some of the issues that were discussed during the recent 3D One- Day Workshop Snapshot sessions held at Ngee Ann Polytechnic in Singapore. Supported by the Media Development Author- ity of Singapore (MDA), and with partners like LSV Enterprise, 3Ality Digital, Sony, Fujinon, Vinten and JVC, the workshops imparted to participants that conceiving a production idea that translates well to stereoscopic 3D is just the start. This is because a professional 3D production requires detailed knowledge of not only the technology, but also 3D's limitations as well as its creative pluses and minuses. The trainer for the three days of snap- shot workshops was Ray Hannisian, who is also the chief stereographer at 3ality Digital. 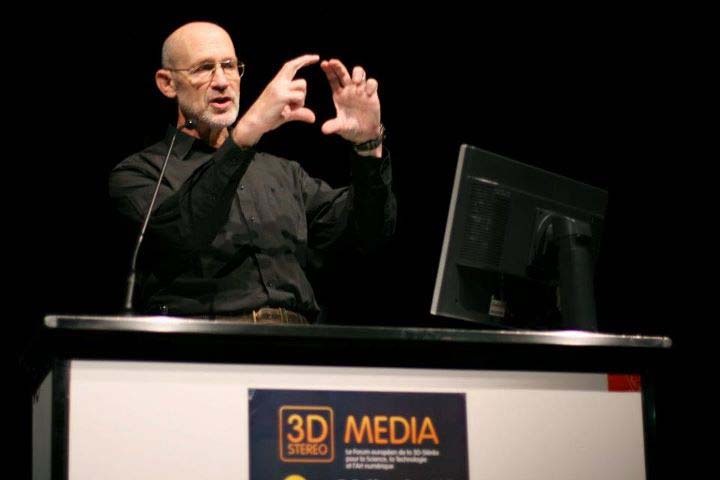 For over 30 years, Hannisian has worked extensively with stereoscopic image creation, (still and moving, on film and via electronic capture), and designed, built and utilised his own 3D video productions. Topics tackled at each workshop included: Working principles of the 3ality 3D rig & stereo image processor: System build-up; camera & lens alignment; image processor manipulation; convergence; interocular distance; parallax; and polarisation. n Visual-effects creation: Interocular distance and convergence; the effects of different types of lenses and cameras in 3D; screening of good and bad 3D content; using 3ality demos hands-on session; and 3ality 3D rig & stereo image processor production. In case studies: Feature-film/sports/ single-cam versus multi-cam. 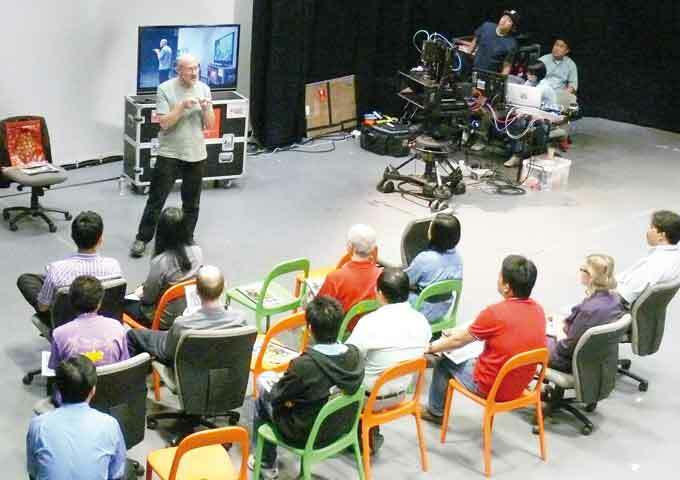 JVC Asia, which provided the 3D monitors used by the participants, revealed that the workshop on the last day was created specially for terrestrial broadcaster MediaCorp, as the local broadcaster is very much interested in providing 3D production training for its staff. Said Marion Dimayuga, sales & marketing, Professional Products Division, for JVC Asia: "JVC is happy to bring its high- performance professional 3D monitors into this workshop in support of MDA's early drive to promote 3D technology locally." Of the monitors JVC provided, he noted: "As with any other customer who've seen and used these monitors worldwide, [JVC monitors] have attracted a great deal of interest among the attendees making the whole 'stereography' learning experience more compelling." Dimayuga added that he was told more 3D workshops would be forthcoming early next year, still with the support of MDA. 3D workshops have been a hit with local production crews. "This means, we would have to supply [workshop organisers] with these 46-inch stereoscopic monitors again ... along with our upcoming 24-inch broadcast-grade 3D LCD studio monitors, which will be available next year," he concluded. BURBANK, Calif., April 14, 2010/PRNewswire/ -- 3ality Digital LLC (www.3alitydigital.com) today confirmed it will enable the live stereoscopic 3D (S3D) broadcast of the Indian Premier League's (IPL) final four cricket matches later this month. In its third season, the IPL is widely regarded as India's most-watched sports property, with its first 33 matches reportedly reaching a cumulative audience of more than 130 million viewers. 3ality Digital's systems will be used to bring the IPL's two semifinal matches as well as its third-place and final matches to 3D-enabled theatres in 13 cities. The IPL has indicated in news reports that it is considering making all 94 of its matches next year available in S3D. This month's broadcasts, which will begin with the first semifinal match on April 21, are the latest in a series of high-profile international broadcast projects utilizing 3ality Digital systems. The most recent overseas project to incorporate 3ality Digital systems was BSkyB's landmark broadcast of the Manchester United versus Arsenal soccer game to pubs throughout the U.K. "The IPL is one of the largest sporting events in one of the world's largest nations," said 3ality Digital Director of Production Ted Kenney. "We're looking forward to transforming the way India's millions of cricket fans enjoy the fast-paced action of their favorite game and introducing them to the dynamic entertainment experience S3D provides." On March 30th, 2010, 3ality Digital partnered with AEG Worldwide and Regal Cinemas to deliver the country's first S3D simulcast of a live concert. The fist-pumping, foot-stomping Black Eyed Peas show was shot with 3ality Digital technology and transmitted from the Staples Center to a 70' screen in the Regal Cinemas at LA Live. 3ality Digital's technology was built on the lessons learned from our debut production, "U23D". U2 3D was the first movie shot completely in digital S3D, and features techniques never before seen in the medium, including multiple image layers, quick cuts that are comfortable on the eyes, full optical zooms, and balanced depth between shots. 3ality Digital developed these techniques, and then built them into our camera platforms and stereo image processing software – making creative, dynamic S3D image capture possible, right at the scene. 3ality Digital technology has powered a number of live‐action firsts, including U2 3D, the first movie shot completely in digital live‐action S3D; the first live S3D broadcast of an NFL game (Raiders vs. Chargers, Dec. 4th, 2008); the first live S3D sports broadcasts available to consumers, including the 2009 BCS Championship Game, BSkyB's landmark Manchester United vs. Arsenal soccer broadcast and the first network hockey telecast ever produced in S3D (New York Rangers vs. Islanders, March 24, 2010, on MSG); the first S3D commercial broadcast on television (Sobe Lizard Lake); and the first episode of a scripted television series shot in digital live‐action S3D ("Chuck vs. The Third Dimension", aired on NBC on Feb. 2, 2009).